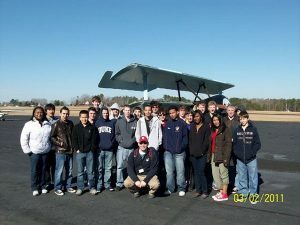 Empire Aviation welcomed 20 students from Durham’s Riverside High School to the Henderson-Oxford Airport on Wednesday, March 2, 2011 . The high school students, who are in the Pre-Engineering Pathway at Riverside’s Engineering Academy, take special courses in design, engineering, electronics, material processing and computer applications. According to Adam Davidson, an Engineering Teacher at the Academy and one of the coordinators of the event, the field trip was designed to reinforce many of the concepts taught in the senior level Aerospace Engineering course, ranging from the history of aviation, to the working parts of an airplane and the forces of flight. While at the airport, the students were able to view a number of aircraft based at the field, including a Beechcraft King Air and a flying replica of a 1917 Fokker-Flugzeugwerke Dr.I Dreidecker triplane from World War I. In addition to a presentation on aerodynamics by Paul Hesse, students heard from a number of Empire Aviation Flight School students and licensed pilots, including Kevin Barbee, Vickie Barbee and Matt McKee. 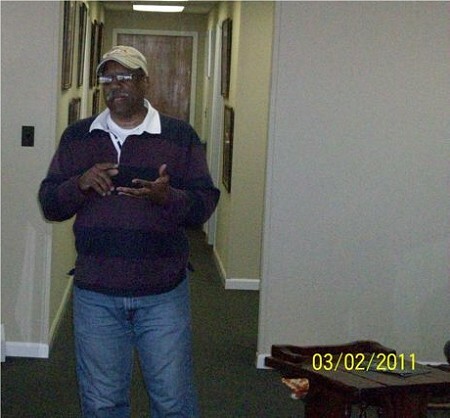 LeRoy Walker, Jr., Vice-President of the Heart of Carolina Chapter of the Tuskegee Airmen, gave a short talk on the organization’s role in aviation. The students then watched and listened on the radio frequency as Kevin and Matt flew the pattern in the flight school’s Cessna 172 and Piper Cherokee aircraft. On the return to Durham, the students stopped at Airwise Aviation at the Lake Ridge Aero Park. They were met by William & Lisa Burwell, A&P’s / IA (Airframe and Powerplant Mechanics, Inspection Authorization) who gave them a tour of their maintenance facilities as well as a number of airplanes on the field.